If you’re living with disability, feeling comfortable and confident can sometimes be a challenge. Being creative is proven to improve mental health and happiness, and thanks to Ability Arts – an arts program run by Chorus –­ people living with disability are able to explore their creativity through art. Mandurah Team Leader Community Connections, Chene Van der merwe, says group numbers are kept small, with participants encouraged to work towards an end goal that everyone can celebrate. Ms Van der merwe says people aged up to 65 can be referred to Ability Arts as part of their disability support plan under the National Disability Insurance Scheme or the Commonwealth Home Support Programme for people aged over 65. Many customers taking part in Ability Arts have learning disabilities, but the program also caters to people with mental health and other disabilities, including a higher-needs session that is focused on customers socialising and just being there. Chorus Support Worker Elli Moody says Ability Arts is about using art in a way that enables people to improve their confidence, build skills and join a social group. She says under the NDIS, there has been a shift from group activities to individual support programs. But social interaction, especially through art, is increasingly seen as an important mental health tool. “It’s just a way to express yourself and it’s quite often skills that people have that they don’t know they have until they try,” she said. Ms Moody said one pottery artist, for example, had found his strength by creating little spotted-coloured clay pots that had been bought by a local restaurant for its dining tables – resulting in further orders and commissions. 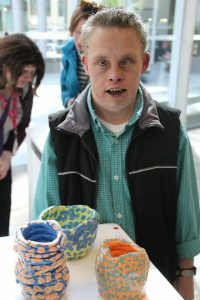 Other artists taking part in Ability Arts can also display their work in an in-house gallery space called the Corner Shop, with funds from sales reinvested into the program. 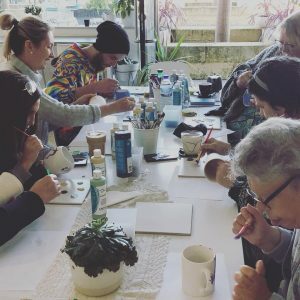 They are also encouraged to take part in regular exhibitions, such as at the local Mandurah Art Gallery and Falcon eLibrary and Community Centre. Vacancies are currently available in most activity groups at the main Ability Arts hub in Mandurah. Ms Van der merwe says the types of activities are also flexible based on demand and the program is also available at various other Chorus social centres. Activities take place on the same day each week based on a monthly schedule, with participants also encouraged to take part in organised outings. More information on Ability Arts is available on the program’s Facebook and Instagram pages, or you can contact Chorus on 1800 264 268.